Solid Poplar in Rich Glossy Finish. White Crepe Interior. All wood green design, eco friendly. For the Jewish custom, simplicity is important when it comes to casket or coffin selection. 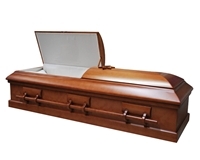 Our Shalom casket models are made from solid wood material without any metal parts or animal based glues. Their styling is simple but elegant. The Star of David décor is detachable. These eco friendly green caskets can also be used for other religion funeral services when simplicity in casket selection is a requirement.